"Where you heading young lady?" a curious, wizened old man fueling up nearby asked as I hopped out of the truck. Fumbling in the freezing cold for the pump, I replied, "Schweitzer Mountain in Sandpoint. Snow was just beginning to fall as we pulled our truck and Airstream trailer into a vintage looking service station in Northern Idaho. "Where you heading young lady?" a curious, wizened old man fueling up nearby asked as I hopped out of the truck. Fumbling in the freezing cold for the pump, I replied, "Schweitzer Mountain in Sandpoint. Have you ever been?" The wind was now picking up around us whipping huge snowflakes all around our heads. 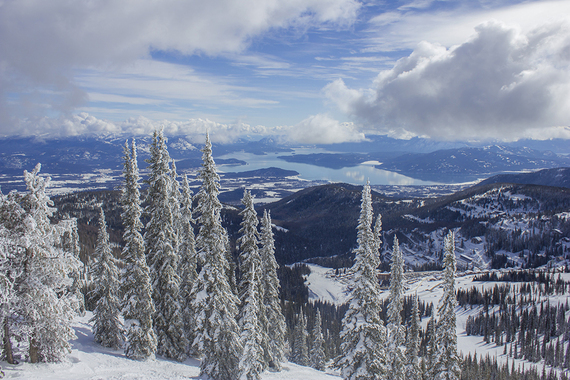 "Oh yeah, good ol' Schweitzer Mountain. You'll like it!" he hollered. "The views from the top -- you'll never forget 'em!" I couldn't help but smile and tell him, "Thank you!" After all these years of wanting to visit this part of our beautiful country, we were finally on our way and I could hardly wait. A few hours later we pulled into our camp site at the Bonner County Fairgrounds with plenty of daylight left. We set up camp and learned that as timing would have it, our trip also coincided with Sandpoint, Idaho's annual Winter Carnival which included such events as Skijoring (a Scandinavian-inspired, centuries-old contest with horses and riders pulling skiers around a course at daredevil speeds), Laser Light Shows, Fireworks and Cirque de Sandpoint to name just a few. Skijoring just happened to be taking place at the Rodeo Arena at the fairgrounds when we arrived so we decided to walk over and have a look. It was pretty incredible to watch! We rose early the following morning and drove up the winding road to Schweitzer Mountain. We had a room booked at the Selkirk Lodge (which was slope side, ski-in-ski-out with unsurpassed mountain views) so hubby could join Selkirk Powder on an early morning cat skiing tour the following day. As Wikipedia describes it, snowcat skiing is off-trail, downhill skiing that is accessed by a snowcat instead of a ski lift. A snowcat is an enclosed-cab, truck-sized, fully tracked vehicle designed to move on snow. Most snowcat skiers are seeking specific, pleasurable skiing conditions that are hard to replicate in the highly manipulated terrain of ski resorts such as powder snow. When hubby came back from his snowcat skiing adventure I could hardly wait to ask him how it was. "It was truly an experience well beyond my expectations. We started with an avalanche safety and transceiver beacon drill after which we immediately dropped into and carved up some pillowy drifted glades. Each following run seemed to be deeper, dryer, and longer. It was so awesome"
"How did you like your guides?" I was curious . . .
"Our guides were Jessie and James and they were awesome. Ken, who was the owner/operator was with us too and the presentation and tour of the Selkirk Powder Cat's skiing terrain was nothing less than top shelf. We definitely have to come back again. The exhilarating experience of riding ten fifteen hundred vertical feet of back to back untracked pitches of powder is more than words can express." As hubby and I skied the terrain of Schweitzer Mountain over the next few days, our son B enjoyed professional ski lessons in the morning. Hubby and I can say that he is now an even better skier but more importantly, the kid had a great time and made new friends. Each afternoon after his lessons he would beam, "Mommy, I had such a fun time!" The list of guided and non-guided adventures on Schweitzer Mountain and activities are simply jaw dropping from skiing, terrain parks, snowboarding, Nordic skating and track, cat skiing, snowshoeing, zip lining, inner tubing and soaking in the hot tubs, one this is for certain - Schweitzer Mountain Resort is truly Idaho's Hidden Gem and is not to be missed. And that wizened old man at the gas station who raved about the views that we wouldn't forget? He wasn't kidding . . .